I woke up at 11:00 AM and then again at 12:45 and finally got up at 1:15 PM. At 2:00, I walked across the street from the hotel into the shopping complex and went to Osuuspankki Bank (one of the 3 national banks besides Nordea and Sampo) to change some money into Euros. I had a cappuccino at Brazil Kahvi [, +358-] and walked back, packed up and checked out of the hotel. At 2:40, Marcia drove directly south the 65 miles to Helsinki and we arrived at 3:50. 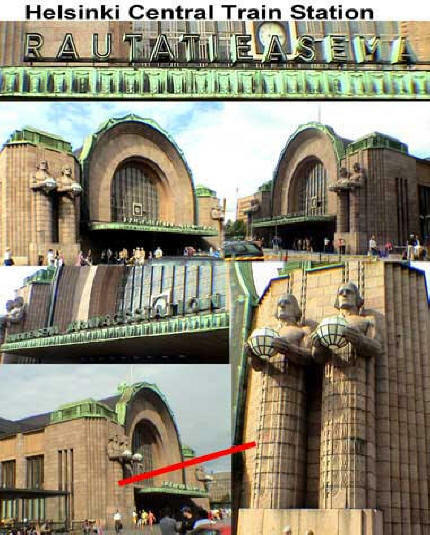 The GPS was finally working again and it brought us to the downtown area and we found the huge Central Train Station. We parked there and went inside to purchase the train tickets to St. Petersburg I had booked. The 1st Class one-way tickets for two cost €157.60 ($185.) Now we were set to enter Russia. I had previously thought we could simply catch a ferry across the Bay of Finland but after researching it I discovered that the only way you can do that is by being on a cruise ship and we were certainly not up for the cost of any cruise. 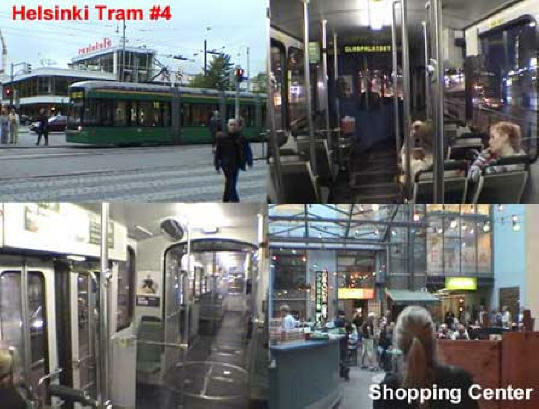 Below are maps of downtown Helsinki and photos of the train station. 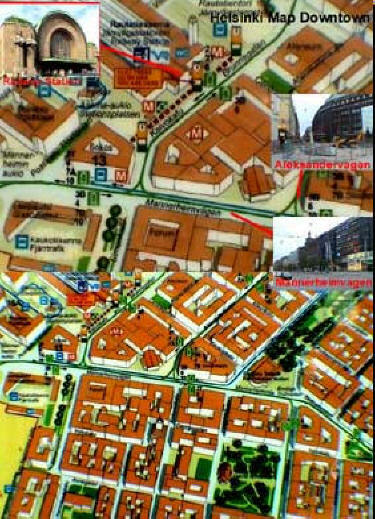 By 4:30 the GPS took us to the Scandic Continental Hotel [Mannerheimintie 46, +358-94-737-2255] for €92 ($110) per night. I had been asking for hotel advice from two sources. 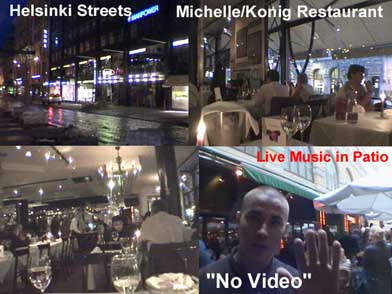 Dimitrii’s Russian friend living in Helsinki recommended the Continental but Esa (the ThinOptX rep) had recommended the Scandic Marski hotel, which I later discovered is more centrally located. They gave us a nice room and after unpacking the entire car (for the 1st time on this trip,) at 6:30 I went and had a cappuccino at the hotel restaurant called Olivo and worked on the computer. An hour later I went back to the room and joined Marcia in completely reorganizing our luggage situation. 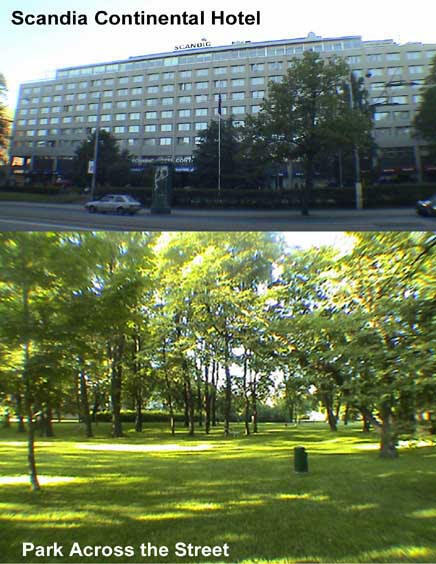 I then changed and at 9:00 I did my run in the beautiful lakeside park across the street (see above right,) which led me to the downtown area and to the Marski hotel. I went in and they let me take a look at one of their rooms. This was a much better hotel and the rooms were nicer as well as air conditioned. I decided we should consider moving. 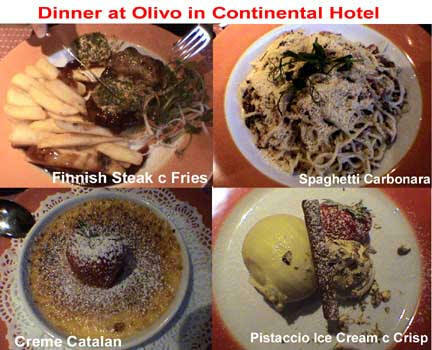 I took the tram back to the hotel and Marcia and I at 10:15 decided to have dinner here in the hotel, at Olivo [, +358-] which was very nice. I had a coke and Marcia house red wines during dinner. She had a Finnish steak with fries followed by crème Catalan while I had spaghetti carbonara and then pistachio ice cream with a crisp. By 11:30 I had finished Diarios #11-13 and also called Judy McGill, our realtor, regarding renting our Georgina house in Santa Monica. She told us that she has a Russian family ready to rent the house. Rather coincidental, with us heading for Russia. The hotel let me do email on their computer which I finally gave up on at 3 AM and went to bed. Helsinki is the capitol of Finland and has a population of 550,000 people (10% of the country.) It was founded in 1550 and it is called Helsingfors by the Swedes who took it over in the 18th Century before losing it to the Russian Tsar in 1808. The city occupies a peninsula linked by bridge and boats to nearby islands surrounding it. Stockmann’s is its huge department store. 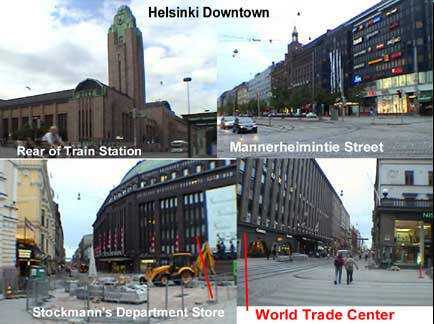 Its major shopping streets are Pohjoisesplanade and Eteläesplanade. We’ll be back here to explore this city more fully after we get back from Russia but for now it’s our resting spot after six weeks of traveling. At 7:30 AM, we were woken by a call from Judy McGill, who forgot about the time 10 hour time difference between Santa Monica and Helsinki. I went back to sleep and woke again at 1:15 PM but didn’t get up until 3 PM. At 4:00, Marcia went shopping downtown for 3.5 hours. I sent out Diario #12 and then had a cappuccino at Olivo at 4:45 and wrote Diarios #14 & 15. At 7:20 I placed a long distance call home and talked to Juriis Killovs, our new Russian tenant and then faxed the signed lease to Judy. I changed and went for my run at 7:30 and ended downtown at the World Trade Center. I took the street route this time along Mannerheimintie Street. I looked at all the restaurants and found the place I wanted to take Marcia for dinner. I also found this nice little place to relax and have a cappuccino at Café Alexander [, +358-.] At 8:30 I took the tram #4 back to the hotel, picked up Marcia and at 9:15 we took tram #7 back downtown to Aleksandergate. We walked to the restaurant Michelle/König (right) [Mikonkatu 4, +358-6-844-0716.] It was really lively with a huge crowd and a live band playing in the courtyard restaurant just outside. The young man above right told me that videotaping was not allowed. 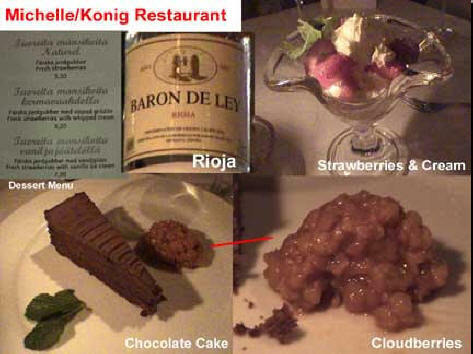 We each had some Baron de Ley Rioja wine after I had a Koff beer. 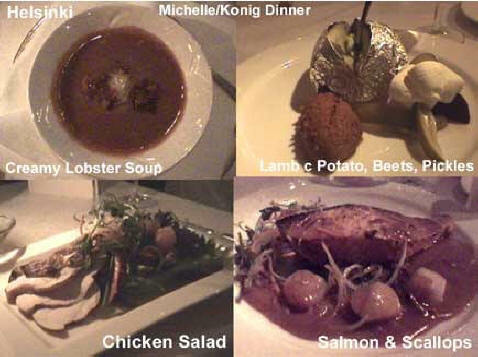 I had Perinteinen lammasherkku (traditional lamb) appetizer with baked potato (lisukkeena uuniperunaa), beets & pickles, grilled salmon & scallops (pariloitua lohta ja kampasimpukoita). Marcia had creamy lobster soup (hummerikeittoa andelot), chicken salad, and finished off with strawberries and whipped cream (mansikka). The dinner was quite fabulous and just when the music began to be too loud we left and went out to the patio to see the action. As I was filming, a young man came up to me and told me to stop. Something about the band having a rule against being taped. At 11:45 we walked back and took tram #4 to our hotel. We leave for Russia in the morning so we did our final packing for the week-long trip. Since there was no air conditioning, I had to get a fan from the front desk which helped a little. Now I know I want to move to the Marski Hotel. I did email again and went to bed at 2:30 AM.